John P. Butler, chief executive of Inspiration Pharmaceuticals, founded by two men whose sons have hemophilia. Scott Martin’s son was still a newborn when nurses began to suspect the baby had hemophilia. The diagnosis sent Martin and his wife into a tailspin for about six months - then they began searching for treatment. 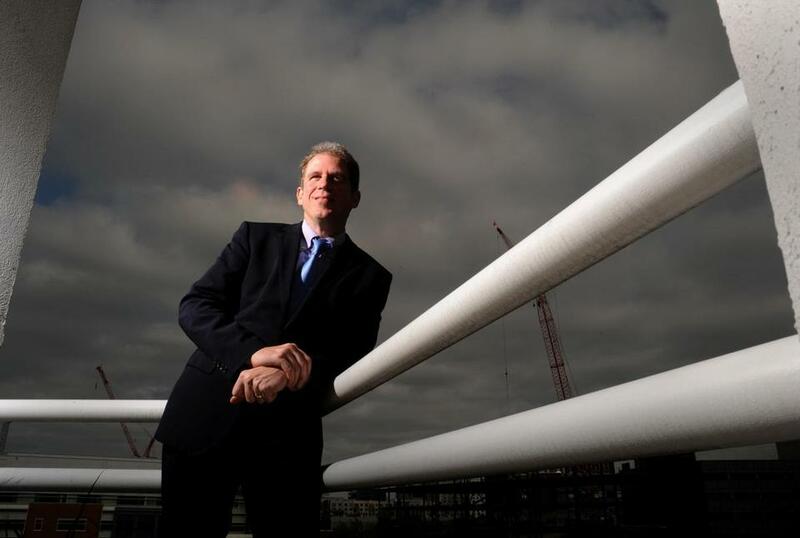 Three years later, frustrated by the lack of options, Martin, a Texas energy executive, pooled his wealth with John Taylor, a New York financial services executive whose own son is a hemophiliac, to launch a biotechnology firm, now based in Cambridge, focused on discovering a cure for the bleeding disorder. Lorraine Heidke-McCartin of Hanson led a protest of FDA policies outside the Biotechnology Industry Organization’s conference in Boston Tuesday. Martin and Taylor are among the many patients and their families taking an increasingly larger role in drug development, inspiring new treatments, working closely with pharmaceutical companies, matching patients with clinical trials, paying for research, and lobbying to speed drug development. In doing so, patients are pushing their diseases into the limelight and fundamentally changing the way the biotechnology and pharmaceutical industries, as well as the government, approach drug creation and approval, and patient care. Patients and patient groups have taken high profiles at the Biotechnology Industry Organization convention in Boston this week, appearing on panels, protesting regulatory policies, and hobnobbing with pharmaceutical executives to press for more investment and research into new drugs. The companies appear to be listening. Major firms such as Biogen Idec of Weston, Pfizer Inc. of New York, and French pharmaceutical giant Sanofi, the parent of Genzyme Corp. of Cambridge, have agreed to partner on several initiatives with patient groups such as The Michael J. Fox Foundation for Parkinson’s Research. The activists bolstered their case by becoming experts on HIV and AIDS, able to converse with doctors and drug developers about clinical trials and the federal approval process. “What the AIDS activists did was they broke the barriers down to let [patient] groups and this type of expertise into the room,’’ Anderson said. The AIDS activists paved the way for advocates like Pat Furlong, whose two sons died of Duchenne muscular dystrophy in the mid-1990s. When they were first diagnosed with Duchenne at ages 4 and 6, Furlong borrowed $100,0000 to finance research, pretended to be a doctor to nab meetings with experts on the disease, and staked out pharmaceutical executives to beg them to find treatments. In 1994, she founded Parent Project Muscular Dystrophy, a nonprofit advocacy group that invests in drug research and clinical trials for the disorder, a genetic defect that causes muscles to weaken over time for lack of a certain protein. In the last decade, the nonprofit has raised and spent about $20 million to build a registry of patients, press companies to develop better drugs, and design clinical trials. Drug companies increasingly see such patient communities as important components of their business strategy. Genzyme pioneered patient-pharma relations as it created drugs to treat rare enzyme deficiencies. Genzyme works with patient groups to lobby government officials in various countries to make sure its expensive drugs - which can cost hundreds of thousands a year to treat a single patient - are covered by insurance or subsidized when necessary. One of the company’s first successful drugswas developed based on work spurred by a father looking to cure his children of Pompe disease - a story chronicled in the Harrison Ford movie, “Extraordinary Measures,’’ based on a book by Wall Street Journal reporter and former Globe staffer Geeta Anand. Patients and their advocacy groups also played a large role in the development of a highly effective treatment for a rare form of cystic fibrosis by Vertex Pharmaceuticals of Cambridge. The nonprofit Cystic Fibrosis Foundation provided the company with millions of dollars - much of it raised by Boston businessmanJoe O’Donnell, whose son died of cystic fibrosis - to help finance research, development, and clinical trials. The drug, Kalydeco, was approved by the federal Food and Drug Administration this year. The Michael J. Fox Foundation is following a similar path, providing money to biopharmaceutical companies to accelerate the development of new drugs. The foundation has benefited from the high profile of its founder, television and movie star Michael J. Fox, who has Parkinson’s, said Todd Sherer, the foundation’s chief executive. “Michael’s profile was really important in getting attention to Parkinson’s, not only drawing research funding, but researchers,’’ Sherer said. Patients and their families are becoming not only partners with drug companies, but also political activists. Breast cancer survivor Lorraine Heidke-McCartin and her husband Phil McCartin, for example, lead a group of activists pushing federal regulators to speed up the approval process for experimental cancer treatments. 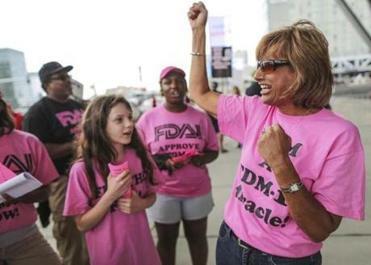 On Tuesday, the McCartins organized a demonstration that drew about two dozen people outside the BIO convention at the Boston Convention & Exhibition Center to protest FDA policies that they say keep cancer victims from new drugs that could save their lives. The biotech and pharmaceutical industries have also been critical of how long it can take to approve new drugs. “We want flexible treatment and informed choice,’’ said McCartin, whose wife was diagnosed with an aggressive form of breast cancer in 2006. An FDA spokeswoman said the agency has sped up its drug approval process in the last several years, while still ensuring the drugs are safe. Still, even at its fastest, drug development can take years. Martin and Taylor, whose sons have hemophilia, launched their firm, Inspiration Biopharmaceuticals, in 2006, but haven’t yet brought a drug to market. The firm, which employs about 60, hopes to have its first product on the market this year or next, and is conducting clinical trials on a second treatment. Taylor laughed a bit as he recalled his journey to this point: learning about his son’s condition, making friends and acquaintances in the hemophilia research world, and finally partnering with the Ipsen Group of France to pursue the drug treatments the company is developing. And how does his son feel about his dad’s endeavor? “My son [still] can’t believe it, of course,’’ Taylor said.